Fenimore Art Museum, Cooperstown, New York, Gift of Stephen C. Clark, N0209.1961. Photograph by Richard Walker. Thomas Jefferson was the second vice-president and the third president of the United States. He was born on a plantation in Virginia and would live out most of his life in the state, later constructing a home of his own called Monticello. Jefferson began his career as a lawyer and his intelligence gained him fast notoriety. He became one of the youngest members of the Continental Congress and was the main author of the Declaration of Independence. He was eventually elected Governor of Virginia and then joined the U.S. Congress. Jefferson became the Minister to France in the 1780s, becoming friends with the Marquis de Lafayette and supporting the French people’s fight for revolution. 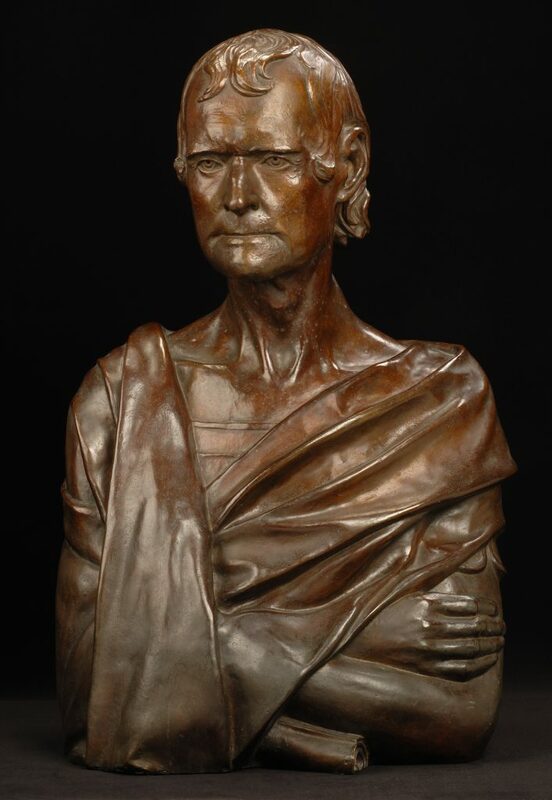 When George Washington became president, he selected Jefferson to become the first Secretary of State. It was in this role that he would come to see Alexander Hamilton, Secretary of the Treasury, as his rival. They disagreed on many subjects, with two of the most important being their stances on the French Revolution (Jefferson wanted the U.S. military to assist the people in their revolution, while Hamilton warned against it and won Washington’s favor) and the establishment of a national bank. Hamilton proposed establishing a national bank which would assume the debts of every state in the Union. Jefferson believed that every U.S. state should work to settle its own debt. He did not like the idea that states with higher debt (like New York, where Hamilton was from) would be able to benefit from states with less debt (like Virginia, Jefferson’s home). A solution was reached in 1790 when Jefferson and James Madison met with Hamilton and agreed to his national bank system if the U.S. Capital could be moved to its current location on the Potomac River. Even though a compromise was reached, the argument split Congress in two and created the two-party system we recognize today. Jefferson resigned as Secretary of State and never spoke to George Washington again. When Jefferson ran for president in 1800 against Aaron Burr and John Adams, it was Alexander Hamilton who lobbied for Jefferson to win the presidency after he tied in electoral votes with Burr. Hamilton did not agree with Jefferson on almost any policies, but he believed that Burr was a larger threat to democracy because he was more concerned with his own self-interest than in the interest of the country. In his two terms as president, Jefferson is perhaps best known for the Louisiana Purchase in 1803 which doubled the size of the United States, and the subsequent expedition of Lewis and Clark from 1804 to 1806.